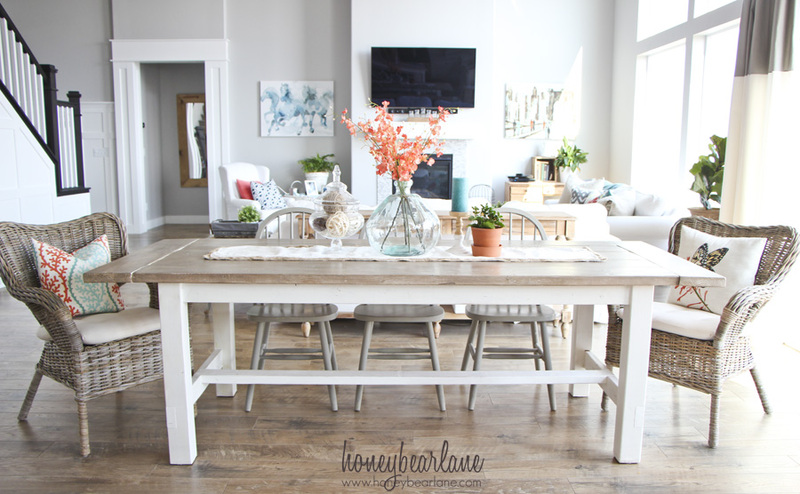 In my DIY Farmhouse Table and Bench post, I talked all about building my table from scratch. 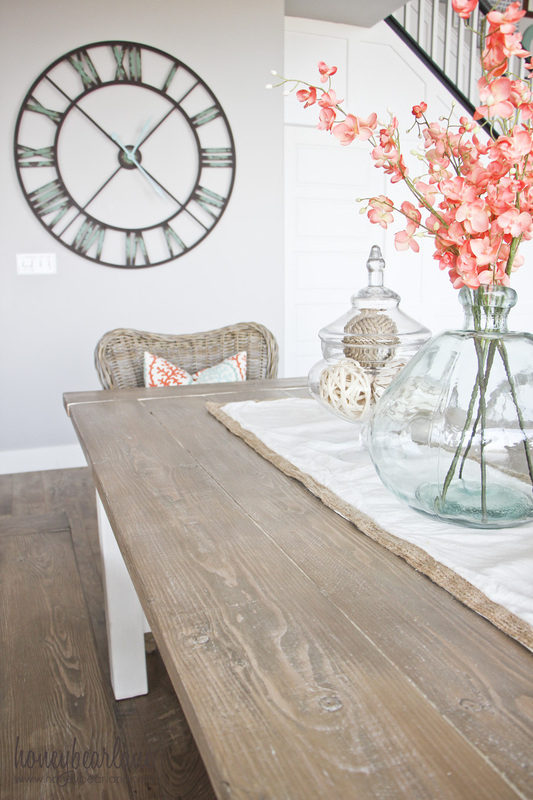 This post is all about how I got my DIY Weathered Wood Finish! 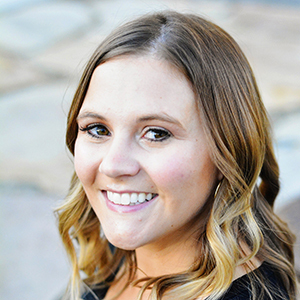 If you haven’t read the table post, you’ll definitely want to check that out first. You guys. I LOVE LOVE LOVE this table. It’s something I’m most proud of. But I also LOVE LOVE LOVE LOVE the finish!! It was super easy and fool-proof. I painted the entire base of both the bench and the table in Chalky Finish paint in Everlasting (I did this last actually.) To get the distressed weathered wood look on top, I tried a new method that I think I will only ever do again. I’ve tried so many different things without success or they just took so many coats of things that it was hard to repeat. But this one worked great and was simple! First white wash the wood. I watered down the rest of my Chalky Finish paint about 50%. It was still relatively thick, not super watery. Then I painted it on and wiped off the excess. I let that dry for a little while. The next step seems a little weird but I promise, it works. You get a can of dark stain–I used Dark Walnut by Minwax. That is scary right? How can such dark stain make the light gray look? But think about it–white and black mixed make gray. So it makes sense. Then wipe on some stain–it doesn’t take a lot. Then you immediately wipe it off. I used it rather sparingly, I found that the stain left on my wiping rag worked great for coloring the edges and sides of the table top. What you are left with is a grayish wood that has white underneath in the spots the stain didn’t touch–like nooks and crannys. Perfect! You could heavily distress the wood first with chains and hammers and whatnot if you wanted, but I wanted my dining table to be as smooth as possible to make cleaning it easier. Finally, take a dry brush and dip it in the whitewash and brush most of it off before lightly brushing the table top in random places. It puts in the white a little more here and there. It only takes the smallest trace of paint to make a difference. And you can wipe it off with a wet rag if you get too much on initially. This last step really takes it to the true ‘weathered wood’ level. How I sealed it is also my new favorite. I used DecoArt’s Soft Touch Varnish. I LOVE this finish. You get that soft, smooth, silky finish without it being shiny or changing the color at all. No yellowing at all, not even a trace of color. I put on several extremely thick coats in the hopes that it would also help fill in the cracks between the planks of wood. UPDATE ON FINISH: I’m going to be honest here…a year later, I regret the finish I chose. It has not held up well at all to kids. When they would get something on it like watercolor paint and it wouldn’t come off, simple scrubbing would dissolve the finish and then I’d end up removing the finish down to the bare wood. I am going to have to take my table outside sometime and sand it down and refinish it completely. When I refinish it I am going to use a polycrylic so I don’t have to do it again. I also don’t love how the table has felt sticky all the time, even when it’s completely clean. 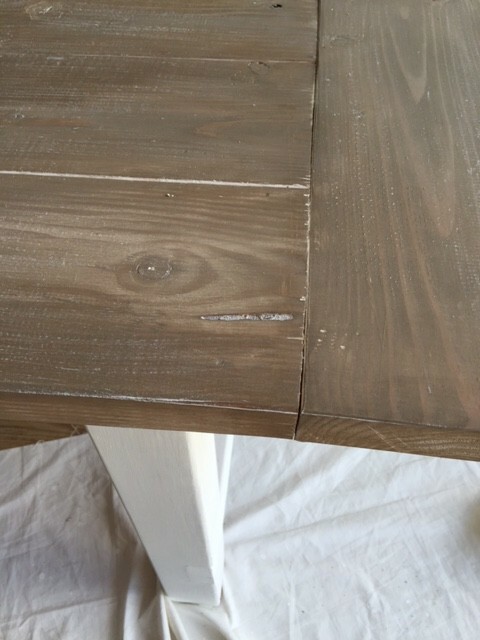 An idea to fill in the planks: Before the table is painted, stained or finished in anyway (basically right after it’s sanded) you fill in the cracks with an epoxy. Just use any basic epoxy (no recommendations because I haven’t actually done this, it’s just a theory I think would work) from a craft store. Hopefully you can get all the cracks filled up without much residue left on top. Let it dry for awhile (at least 24 hours) and then sand the top again and get any epoxy that is on top of the table off. One of my friends tried this and didn’t sand all the filler off first. Then she had to go back and re-sand and then those areas wouldn’t accept stain the same because they were too sanded. Sometimes sanding too much clogs the pores of the wood and it still won’t accept stain. Sigh! Or you can use a table saw to take a little bit off each side of the wood to remove the rounded edges completely and avoid having cracks. Every time I do a project like this table and bench, I feel like I achieve a new building milestone. Like I do something that makes me nervous, find out it’s not that bad, and gain confidence to try something else. And if I can do it, you can too! Remember to PIN this post so you can do this awesome finishing technique later on! How to build a farmhouse table for less than $100! I love the design for this table however when I look at the plans the measurements don’t seem to match with notches with a 2 by 4 going in a 1.5 x 3.5 . I’m new to this so if you could explain why that would help. The actual measurements of a 2×4 aren’t 2″x4″. They are 1.5″x3.5″. When you went back and updated that you regretted the finish, did you just mean that you needed the polycrylic INSTEAD of DecoArt’s Soft Touch Varnish? Do you think it was the DecoArt’s Soft Touch Varnish that made it feel sticky all the time? My husband and I are going to try this finish but want to make sure we do it right! Yes, I wouldn’t use the Soft Touch Varnish again. And yes, that’s what made it feel sticky. When I read that about DecoArt’s Soft Touch Varnish I was worried for you. I say this sadly from experience. Looks great. I do something similar, but keep about 12″ of heavy chain to beat the crap out of the wood to get an old farm wood look. I also randomly drill holes with a small bit. Stain stays in the divots and makes it look like wormholes. You might also want to try Brewax for your stain. It will fill in any gaps or holes with wax as you are spreading it. What paint did you use for the legs? It’s DecoArt Chalky Finish paint in Everlasting. Is that 50 percent watered down as well on the base or just the top?? The only thing I watered down was the white paint. I used full strength on the legs. It was only the top that I watered down. I love the color!! My next project is building a farmhouse table and your color is always the one I keep coming back too! I was going to get weathered grey Miniwax until I realized you used dark walnut and white washed! What a great idea since I already have that color. I just ripped my wood last night and hope to get it done soon. Thanks for a great post!! Epoxy will not absorb the stain or white wash. Hello!! Beautiful table and home. Can I ask you what are the type of floors that the table is sitting on? They are beautiful and very much what I’m looking for. They are laminate floors. It’s Mannington Historic Oak in Ash. Thanks! So glad you like it! I’m actually not sure how this method would work with laminate…the gel stain might be the better option to try. I would just try it on a spot that won’t be seen as much and see if you can make it work. Good luck! Look very nice! How long didyou wait after the white wash? Just until it was dry. Thank you so much for sharing with us your plan and update it afterwords. I want to do the same table, it’s looking really amazing. Could you please tell me how long you have to let dry the wood between every step and how many coat of polycrylic you are planning to put on the top. The wood needs to be dry to the touch and with each coat of poly you need to wait about 4 hours before applying a new one. Hi! How much of the chalk paint did you end up using for the table? Love this! Thanks! Probably about 4 ounces or less. It was watered down. I love your table! Thank you so much for sharing your plans, what you used for paint, and most of all your frustration with the first finish. I love how honest you were with this. Even though it is a relatively cheap table to make it looks sensational and expensive! I am wanting to make this for my outside patio. Do you think that the paint, stain and polyurethane will stand up to the elements well? Or do I need to use products that say for outside use? Thanks in advance for your reply. I would probably finish it with something that is made specifically for the outdoors. Just make sure to leave some gaps between the table slats for drainage because the standing water on it can warp your wood. I love that clock! Where did you get it? did you prime the legs of the table before applying the deco chalky paint? Excited to give this a try! I didn’t prime the legs and used the paint at original consistency…however the wood did bleed through so I would definitely recommend priming it with something strong, maybe a shellac based primer. 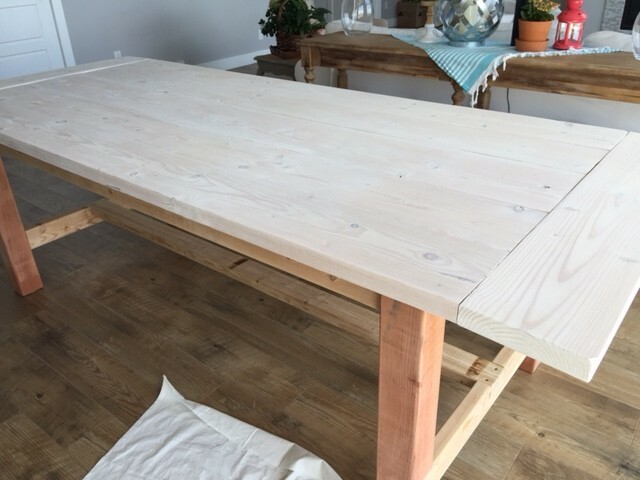 I applied this technique to my new farmhouse table and it worked beautifully!! Thank you so much for sharing! Hi, I like your weathered gray finish, been looking for instructions for this finish for a long time, a quick question, did you use wood conditioner before using dark walnut stain? I have had to use wood conditioner before staining to prevent “blotching” on pine. 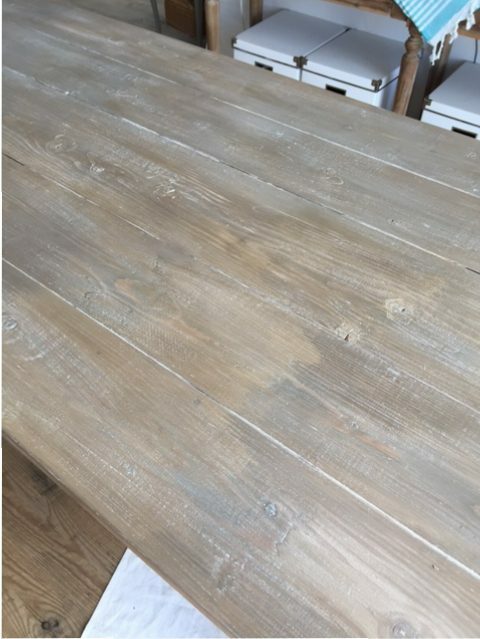 Hi there…I don’t think I used a wood conditioner for this treatment because the first step is to whitewash the table. The paint base essentially is the wood conditioner. It doesn’t turn out blotchy. Thank you very much, will definitely try this. They weren’t strong enough on their own so I later flipped the table over and secured the breadboards with some brackets. Hi! We are planning to build this table next weekend but I’m wondering what type of wood you used? I just used regular pine wood from Home Depot! love this look. We only have the white color available in the home decor chalk paint and I see that you used a sheep color. Would it be okay to use the white color instead? Think it would have that big of an impact on the final color? Thanks! Yes, I just used white. I watered it down so it was a whitewash. You should be fine! Did you use a brush to put on stain first and then wiped? Yes or you can apply the stain with a rag. Love this look! Wondering: the stain is oil based, so is it really ok to use water based Minwax Polycrylic over it? I think it should be okay but you can always test a small corner first! Random question: what kind of paint did you use for your chairs? Do you have a post about them?. P.s. LOVE your table! I used Annie Sloan chalk paint in French Linen. Thanks! What type of finish did you use on the base ? I did the same finish as I did on the top.